Just who is this young man in the bow tie looking terrified? 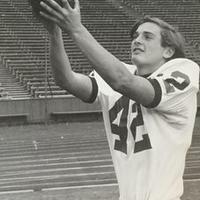 Readers of this column over the past 25 years know that we have never hesitated to run a nice children's picture. Reliable information tells us that the Bow tie boy was about 4 years old at the Maketewah Country Club in Cincinnati, Ohio. 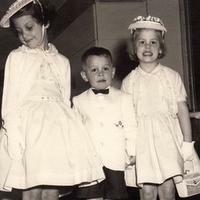 He is flanked by two of his sisters, on the left is Karen Tennis, and on right is another sister, Linda Howitt. Of course the Old Scot relies on the best information for his stories. 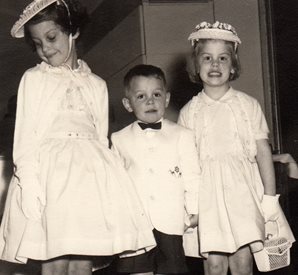 What better source could there be than the youngest sister, hint, she is a Member of the Club, who hadn't even been born when this photo was taken? For those of you who read news in the real world, how about that time capsule they found in Boston? Originally buried in 1795 by Paul Revere and Sam Adams there were newspapers, an engraved silver plate perhaps engraved by Paul Revere himself, 24 rare coins from Colonial times plus other important historical artifacts. To celebrate have a Sam Adams beer. 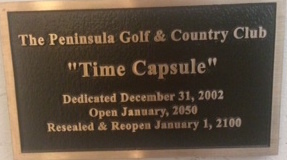 While you drink it, stop by and take a look at the outside of our own Time Capsule of The Peninsula Golf & CC. It's located in the bottom of the stairwell leading up to the fitness center. The Capsule is a true Time Capsule built for that purpose alone. It was sealed in 2002 and is due to be opened in 2050. According to the International Time Capsule Society which is headquartered at Oglethorpe University, 80% of all time capsules ever buried have been lost and forgotten. That was one of the reasons that it was decided to seal our time capsule above ground, although in an albeit inconspicuous location. 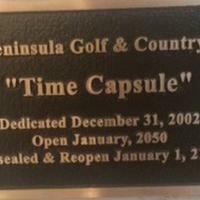 Every day Members pass by the time capsule as they climb the back stairs to the fitness facility, with the time capsule just a foot away. And for those of you who have never noticed, yes, it is marked. So take a look next time you climb those stairs. Finally The Blaster takes note of the passing of a Beresford CC Member, Gus Gustafson. ( I have never adhered to former editor Palmer Mendelson's view that occasionally noting a special Member's passing was a taboo subject). This column is as much about Club History as any other topic and Gus Gustafson and his family played a part in the history of the Club for many decades. Feed back in the mid ‘70s. It started with a round robin with the tennis members enjoying a crab feed in the Beresford Room. My father got the crab for the 40 guests. It became an annual event they organized for years. Slowly the tennis awards were introduced and became part of the nights presentation. Now it's grown into a two night affair open to all memberships." Picture answer: Did you guess the answer to bow tie picture? Would another picture help? Hmmm . 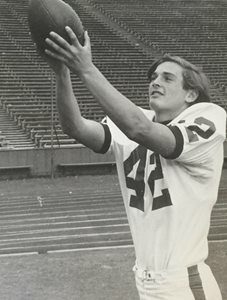 Never done two in one column before but it seems only fair that if I'm going to show the one his sister suggested of him in his bow tie, I should also show him to his best advantage as a star for Stanford Football: The one and only President Jim Taylor.